Itamar Moses (Boardwalk Empire) sets his historical romp in 1722 Leipzig, Germany, where the world’s greatest organist, Johann Kuhnau, has just died in the middle of a frenzied fugue. 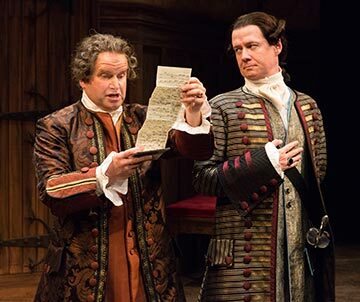 People’s Light & Theatre presents the regional premiere of Itamar Moses’ acclaimed comedy Bach at Leipzig running July 9th through August 10th, 2014 on the Steinbright Stage. Associate Artistic Director Pete Pryor directs. Itamar Moses (Boardwalk Empire) sets his historical romp in 1722 Leipzig, Germany, where the world’s greatest organist, Johann Kuhnau, has just died in the middle of a frenzied fugue. Seven men, all claiming to be Kuhnau’s worthy successor, flock to the famous Thomaskirche (or St. Thomas Church), where Kuhnau presided over the music for Church services and the adjacent school. Blackmail and back-stabbing mix with debates on religion, philosophy, and politics as the men attempt to outdo each other in order to win Kuhnau’s prestigious position. “Whether you are a Bach buff or prefer Lady Gaga, I think you will laugh in unison at this ingenious and hilarious tale of history’s underdogs” asserts People’s Light’s Producing Director, Zak Berkman. All of Moses’ characters were contemporaries of J.S. Bach and each of them did, in fact, audition to be Kuhnau’s replacement. Beyond that, the play is fictional. 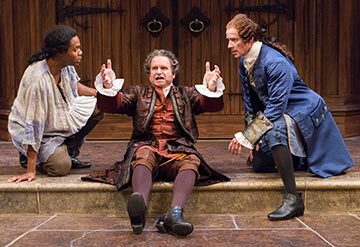 To play Moses’ comic take on these historic figures, long-time People’s Light company member Kevin Bergen portrays Georg Balthasar Schott, David Ingram plays Johann Christoph Graupner, and Stephen Novelli takes on Georg Friedrich Kaufmann. They are joined by Greg Wood as Johann Friedrich Fasch. Making their People’s Light debuts are Danny Gardner as Johann Martin Steindorff and Jabari Brisport as Georg Lenck. People’s Light continues its program called Scoop on Sundays: History, Context, and Gossip, a lively discussion before every Sunday 7 pm performance (July 13, 20, 27, & August 3, 10). Resident Dramaturg Gina Pisasale will host an artist from the production and get the inside scoop about such things as the rehearsal and production process, design choices, and the world of the play. The program begins at 5:30 in The Farmhouse Bistro. Cost of $15 includes light fare. Call the box office at 610.644.3500. Enjoy a prix fixe dinner and a show package for $70 (Wed, Thurs, Sat matinee, Sun eve) and $80 (Fri, Sat eve, Sun matinee) at The Farmhouse Bistro prior to Wed-Sun evening performances. That’s a savings of up to 15% off the single ticket price! If you already have tickets, you can add dinner for just $35. Dinner and a show packages are available through the box office or online at PeoplesLight.org. Bach at Leipzig previews on Wednesday, July 9 and Thursday, July 10 at 7:30 pm and Friday, July 11 at 8 pm. The play opens on Saturday, July 12 and runs through Sunday, August 10. Audiences are encouraged to join the artists for a conversation about the production after the Thursday performances on July 17, 24, 31 and August 7.